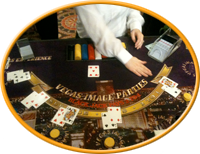 Vegas Image Parties is Dallas Fort Worth’s premier casino party entertainment provider. Operating throughout all of Texas and it’s bordering states. We host a Vegas casino party for all different occassions, including nights for private parties, birthday parties, fundraisers and other special events. We are DFW’s premier Texas Hold-Em Tournament provider doing tournaments for up to 450 people and over 3,000 tournaments performed. We are DFW’s largest owner of Slot Machines for Super Fun Casino Night purposes. We offer all the games of a full service Vegas casino, including Texas holdem poker, blackjack, roulette, slot machines and many more. We provide all the chips, cards and friendly knowledgeable dealers to make your casino party a success. All you have to do is relax and enjoy your Vegas casino party. Just click the Plan Your Party link to get your casino party experience underway!! Listen to this Special Message from our Founder! VIP will meet with your organization to devise a comprehensive casino party fundraising strategy. We are here with our expertise to make you the most amount of money for the least amount of effort. We provide the knowledge for the three essential parts to a successful casino party fundraiser. Also, we provide “ON THE SAME PAGE” casino fundraising dealers and a highly energetic casino fundraising tech to help you with your event. Call us today at 214.350.9524 or 817.26.VEGAS to start the ball running!